CLICK HERE TO WATCH "STAN'S PLAN"
At 56 years old, A. Samuels certainly isn't your average rap artist, but when his "Livin De Life" music video received hundreds of thousands of views in the first days after its release, it was clear that the world was sharing in A. Samuels' mantra: Having money is nice, but only by working hard, playing hard and enjoying every day, can you truly be "Livin De Life." Allen Samuels, an Atlantic City casino executive with a passion for hip hop and a desire to inspire, delivered his inspirational song and flashy video to the world and it became an instant viral sensation. Hundreds of thousands from all corners of the earth enjoyed watching A. Samuels's musical tribute to his effervescent love of life, and continue to echo his #livindelife refrain, both online and offline. 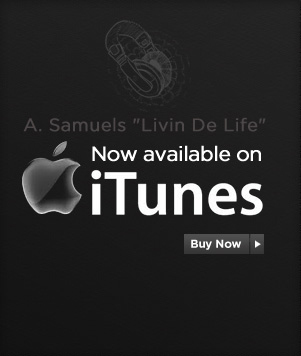 You can expect to see and hear much more of A. Samuels in the near future, but in the meantime, let him ask you this question: Are you "Livin De Life?"